Rb max drive pinion 28 teeth new. Steel sprocket with treatment made in Europe that makes it as solid as the origin. It is not an aluminum gear made in China! It is strongly recommended to couple the 28-tooth gear with the 560cc malossi twin-cylinder kit. New rb max drive sprocket designed to play on the transmission of the maxi-scooter, which is originally equipped with a 26-tooth model. Model 28 teeth, to promote the elongation (+ 2 teeth compared to the origin). Model 24 teeth, to promote acceleration (- 2 teeth compared to the origin). The 24-tooth model is available in our other sales. New, sold in original packaging. In stock - shipping within 24 hours. 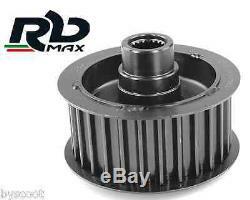 The item "rb max gearbox yamaha t-max 530 tmax 28 teeth pulley transmission" is on sale since Thursday, April 21, 2016. It is in the category "auto, motorcycle parts, accessories \ motorcycle \ parts \ other ". The seller is "motodak" and is located in st quentin. This item can be delivered anywhere in the world.